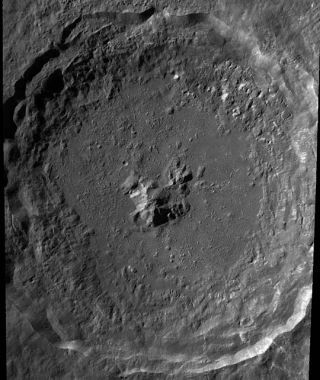 LRO image of Tycho crater. The proposed Constellation site is to the North of the crater's central peak. New photographs taken by a satellite in orbit around themoon have revealed one of its most prominent craters in a whole new light. The moon?s Tycho Crater, though average in size, is specialbecause it appears to have formed relatively recently. The vast crater stilllooks pristine in the new images, while older craters are slowly covered bynewer impacts as their features are obscured over the years. Like all the moon?s craters, Tycho is thought to have formedwhen a space rock slammed into the surface. Since the moon lacks Earth?sprotective atmosphere, which vaporizes small asteroids on collision courses,even tiny rocks can make a dent on the lunar surface. The new images were captured by NASA?s Lunar ReconnaissanceOrbiter (LRO) and released Jan. 14. The robotic spacecraft is on a scoutingmission to map the moon?ssurface in great detail to help plan for the proposed manned trips on thehorizon. Rays of material ejected during the impact are still visiblearound Tycho, as is the central heap of debris that resulted when meltedmaterial flowed back down the crater?s slopes and solidified in the middle.Because it is so well preserved, Tycho offers a unique chance to study themechanics of how craters form, researchers said in a statement. Tycho is about 53 miles (85 km) in diameter. Withoutdirectly sampling rocks from inside the crater, scientists can?t be sure howold it is. One of their best guesses comes from rocks collected byastronauts at the Apollo 17 landing site that may have originated at Tycho andbeen displaced by the impact. Radiometric age dating of these rocks indicatesthey formed about 108 million years ago, meaning the Tycho crater may haveformed then as well. ?This may still seem old, but compared to the 3.9billion-year age for many large lunar craters, Tycho is the new kid on theblock,? LRO researchers said in a statement. To find the truth about Tycho?s age, scientists will needrocks collected inside the crater. These may finally be available soon, sincethe site has been chosen as a possible landing spot for future manned missionsto the moon in the 2020s under NASA?sConstellation program. ?Directly sampling material from within the crater wouldhelp us learn more about not just when Tycho formed, but the ages of terrainson other planets throughout the solar system,? the scientists said.